Decorus Europe are manufacturers of Spill Aid and other specialist and industrial absorbents and spill control products. Specialising in innovative spill care production, from thought process and research & development through to design and manufacture. We can cater for any requirement within this industry and bring fresh ideas and bespoke applications. Decorus Europe has been at the forefront of the absorbent’s industry for many years, and has bought together a large base of experienced personnel all under one roof. Our experts are from all industries across all sectors from both public and private entities and have demonstrated a unique development for loose absorbent’s. Drawing on this experience has proved invaluable in our research and development of Spill-Aid, giving the end user the most remarkable absorbents in the world. Decorus Europe is unequalled in the loose super absorbent’s industry. Our aim is clear, "to produce the best industrial and domestic absorbents available anywhere in the world" that's why we are considered a "Leader of Industry" and not a follower. Our unique expertise in producing the finest grade of industrial absorbents makes us stand out from the crowd, and with a global spread throughout all industries, it's this expertise that keeps us on top. Due to the high absorption capacity and extraordinary efficacy, Spill-Aid Power Absorber does not have a limited range of effect, this means that Spill-Aid is "non-selecetive" and can be used on all spillages apart from Hydrofluoric Acid. Safe to use, it cannot harm humans, animals, soil, concrete, asphalt, tile or plants. Contains no reactive chemicals, is not toxic, flammable, or biodegradable. Spill-Aid can be used on any surface, asphalt, carpet or concrete. Just sweep it up! Or, if using on carpet, simply vacuum it up! 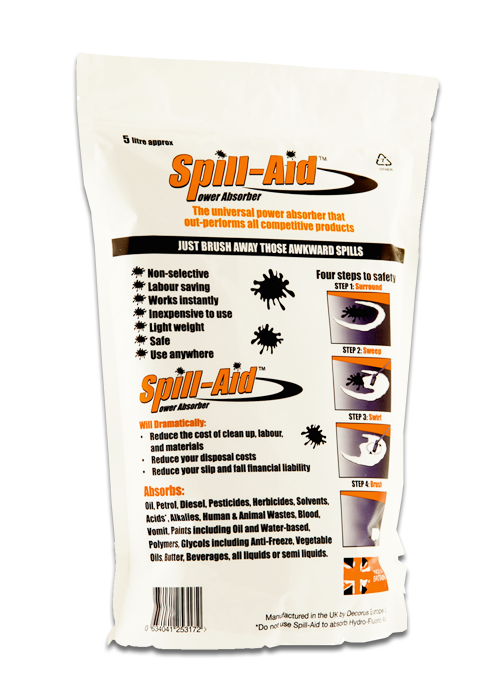 Spill-Aid absorbs more fluid than any other comparable absorbent on the market. It has the ability to absorb up to 30 times more fluid than clay based granules and is at least 5 times more absorbent (pound for pound) than any other absorbent on the market. Just 1 x 5L pouch will absorb 3.5L of fluid (dependent on the spill). THAT’S 7 X ITS OWN WEIGHT. Spill-Aid Power Absorber is the most powerful loose absorbent on the market. It can deal with any type of fluid from oil to wine including semi liquids such as treacle, jam and running honey*. Spill-Aid will absorb between 5 to 30 more than any competitive product Spill-Aid 30L sack weighs 4.5K a 20L clay gradual equivalent weighs 20K. As well as the health & Safety benefits it decreases your wastage cost considerably. It is light weight – A Spill-Aid 30 Litre bag weights only 4.5 Kg where as a traditional clay granules 20 Litre bag weights in at 16 Kg. 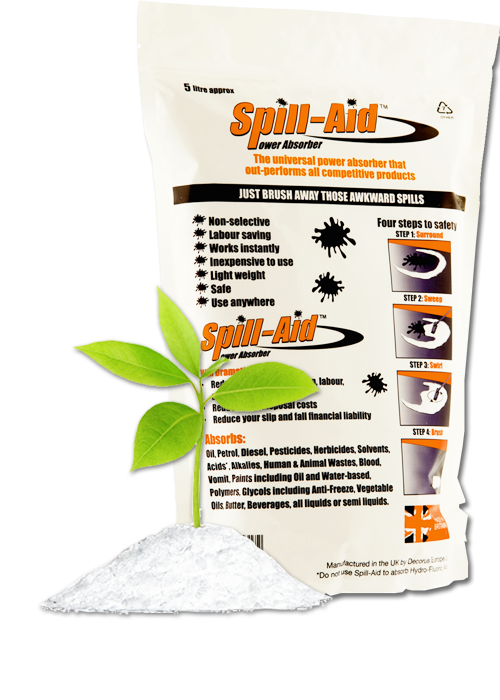 Spill-Aid does not leach – once the spill has been absorbed it will not let it go. Demonstrated on paint with the help of some white spirit to get the last little staining, a very effective solution. This is a demonstration of Spill-Aid absorbing paint, which is a difficult substance to remove especially when it is on a porous surface. The demonstration is on concrete which is a porous surface. We finish it off with a little white spirit as you will see it is very effective. It is light weight which helps prevents staff injury such as bad backs, a 30L Spill-Aid sack weighs 4.5k whereas clay granules weigh 20k+. It is more absorbent than any other product in the market. It is an absorbent rather than adsorbent which means that it actually takes the spill into the substance and will not leave anything on the floor. It is fast acting 20 seconds to absorb compared to clay granules which can take 30 to 40 minutes, which means they can clear the roads much quicker and get the traffic moving again. Environmentally it is an inert substance which means it is better for the environment. Because it is light weight the cost of disposal is massively reduced and therefore saves a lot of money. Used product must be disposed of according to all laws and local regulations for the substance that was absorbed. Also, for your safety, only properly trained and equipped personnel should respond to hazardous waste spills. 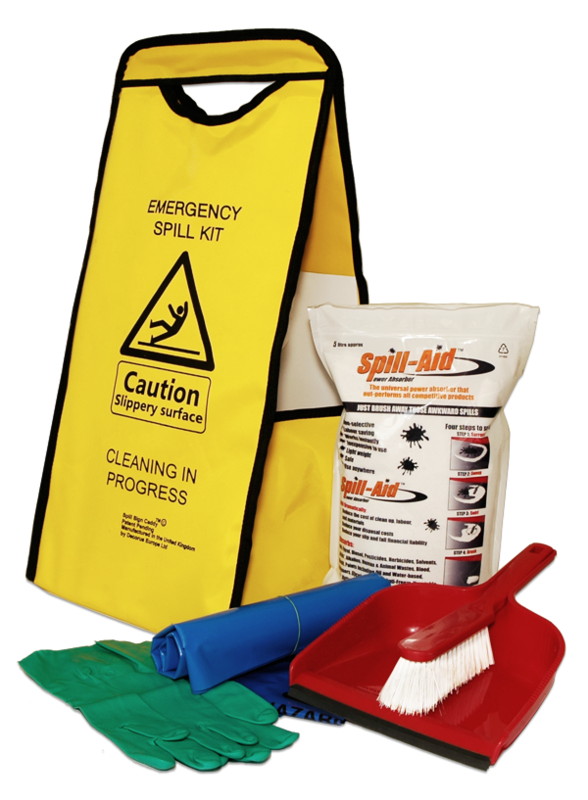 The problem – The Spill Sign Caddy was developed to ensure that staff were forced into good and safe practice when dealing with a spill in an area with a lot of customers. 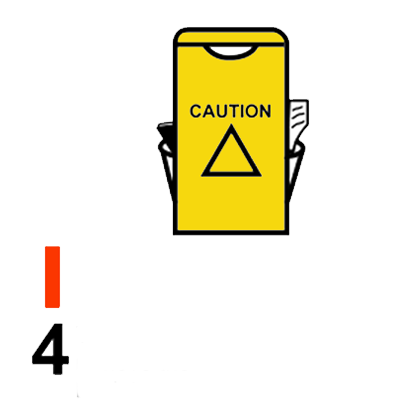 The problem was that staff (often untrained), when faced with a spill would either grab a spill sign to alert the customers of a hazard. Place the sign and then go back to get some paper towels to soak up the spill, the spill could include glass which could be a staff injury hazard. Or alternatively they would just pick up the paper towels and start wiping up the spill, without warning customers which is a legal requirement. 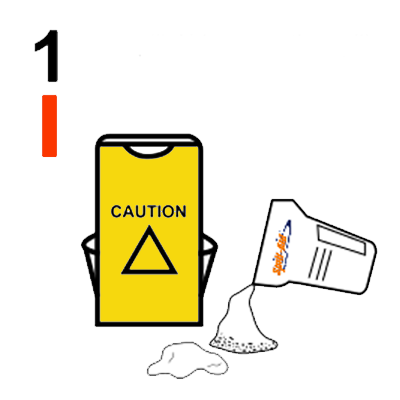 The Solution – The Spill Sign Caddy ensures good practice and keeps staff and customers safe. Dual purpose design - serving both as a cautionary safety sign and a container for a complete, ultra-efficient spill kit. 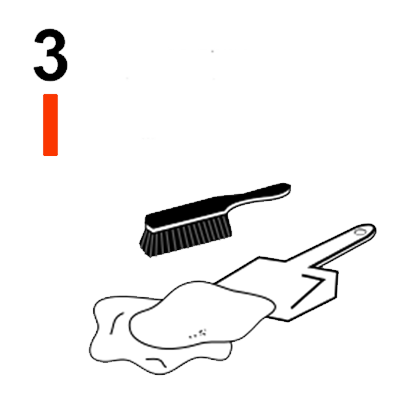 Place all cleaning products to deal with spillages into the caddy (including Spill-Aid Power Absorber - an integral part of the spill management system - sold separately) and your kit is ready to go. 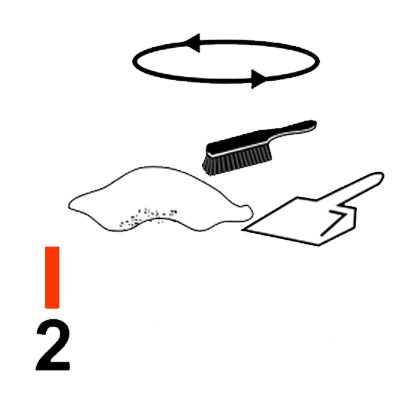 Once you've removed the spill, simply place all of the waste into a suitable waste bag, place into the Spill Sign Caddy and remove from area. No more leaving safety signs out while waiting for the area to dry with the potential for people to slip on the wet surface. 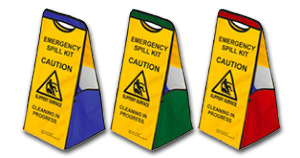 The Spill Sign Caddy can be adapted to your own requirements, so you can include anything else that you may specifically need for your own environment. You can also stamp your own brand on the Spill Sign Caddy too with your corporate branding and or messaging you want to display. It is currently used widely by supermarkets throughout the UK to quickly help staff deal with a spill and prevent injury to both their staff and customers. 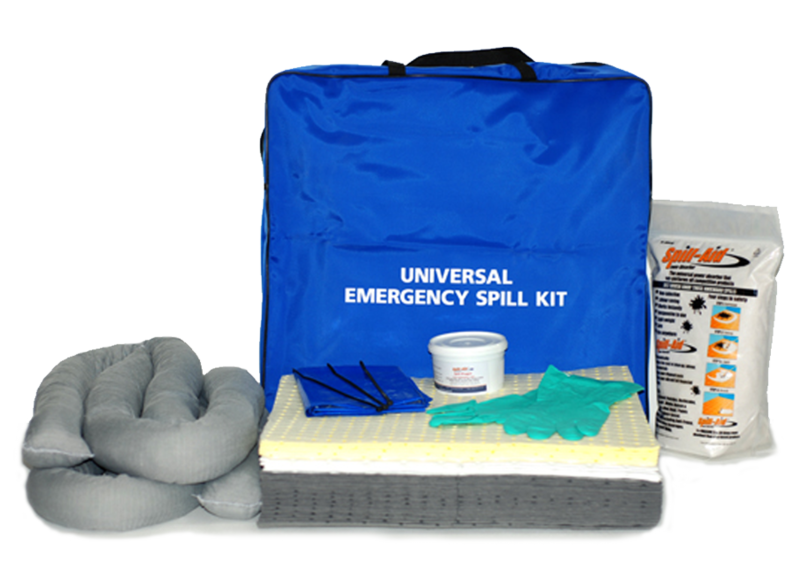 We are specialist manufacturers of various spill kits for all general purpose oil and chemical Spills. Whatever your pollution control requirements, we can provide custom designed kits for every situation within the workplace. With an envious product range - from small to large 1000 litre kits and innovative backpack kits, our competitively priced products are expertly designed. Bespoke manufacturing brings in an unequalled supply to the industry. Branding is of major importance to most companies, that's why we will brand your products at no extra cost (subject to minimum order). Our expertise has now been realised on a world wide basis, and today Decorus Europe is able to demonstrate a Global presence in the absorbents market. Whilst understanding the importance of our prominence within the UK, Decorus Europe are supplying products all over the world. Our sympathetic approach to our clients needs is a second to none in the industry, with this has come the introductions of our two new versions of Spill-Aid, Absorbia Pro, the same great product, but re-branded specifically for the EU with the instructions in six languages on both the front and back of the packaging; making it easier to understand for our European partners - and A1 Power Sorb, a great new product that is now being widely used by our friends across the pond, not least in some states and countries, as it's being used by the US Fire Department - it doesn't come better than that! Supplying: Europe, Asia, Africa, USA and South America. Our expertise and dominance in global exportation is second to none. If you would like further details on any of our products or would like to either purchase or become a valued distributor please contact us using this form, with a brief outline of your requirements. Then one of our friendly staff will contact you to discuss the next step.